The INDIRECT function returns a reference to a range. 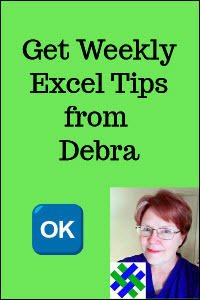 You can use this function to create a reference that won't change if row or columns are inserted in the worksheet. Or, use it to create a reference from letters and numbers in other cells. Thanks to Dave Peterson, for his contributions to this page. Watch this short video, to see how to use the INDIRECT function. Written instructions are below the video. Download the sample INDIRECT workbook, to see the examples. The INDIRECT function is useful when you want to return a value, based on a text string. For example, select a range name from a drop down list, and get the total amount for the selected range. In this screen shot, choose Actual or Budget in cell B2, and the total appears in cell B3. ref_text: A cell reference or a text string (or both), that create a range reference to a cell, range of cells or named range. a1: (optional) Does the reference use A1 reference style? In most cases, a cell reference or combination of text string and cell reference works best with the INDIRECT function. The Budget/Actual example above shows this technique. If you use a simple text string, the range is "hard coded" in the formula, which has limited usefulness, except for locking a cell reference. See the examples below, for referring to a different worksheet, or a different workbook. NOTE: If the INDIRECT formula refers to a different workbook, that workbook must be open, or the formula will return a #REF! error. The INDIRECT function can "lock" a specific cell in a formula. Then, if rows or columns are inserted or deleted above or to the left of that cell, the reference does not change. Without INDIRECT, the reference would automatically adjust. To see how this works, follow these steps to create two formulas -- one with normal cell references, and one with an INDIRECT function. 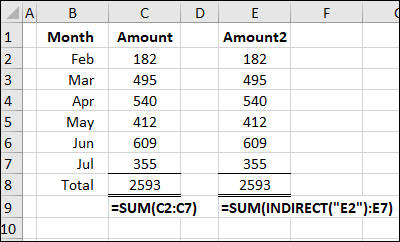 To see the difference between the formulas, insert a blank row above row 2, and enter 100 for January, in cells C2 and E2. The total amount changes in column E, because the start cell is locked at E2. 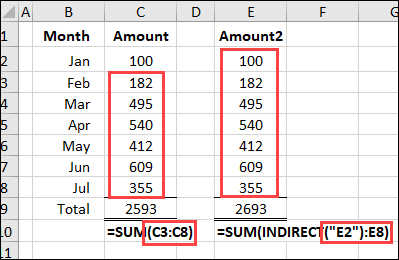 The total amount does NOT change in column C. The start cell shifts down to cell C3. An INDIRECT formula can also refer to cells on other worksheets. In this example, you'll create a formula with the INDIRECT function, using references to a sheet name and cell name. The string ends with a reference to cell B2, which contains the cell address. Single quotes are included in the string to prevent errors if the sheet name contains space characters. 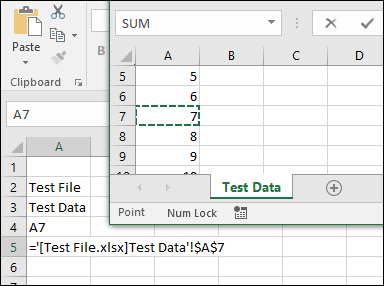 Press the Enter key, and the formula returns the number in cell A2 on the Data Sheet worksheet. Change the number in cell C2, and the result in D2 will change. An INDIRECT formula can refer to cells in other workbooks, but will return a #REF! error if that workbook is closed. In this example, you'll create a formula with the INDIRECT function, using references to a file name, sheet name and cell name. Next, follow these steps, to create a workbook that will link to the data workbook. Or, get the download file, and go to the WkbkRef sheet. 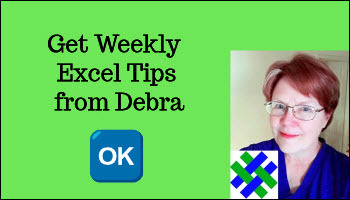 Next, follow these steps to create an INDIRECT formula that uses the same syntax. The formula will include the single quote marks, square brackets and exclamation mark. The & (ampersand) characters join all the parts of the text string together. A4 is the cell with the data cell address. 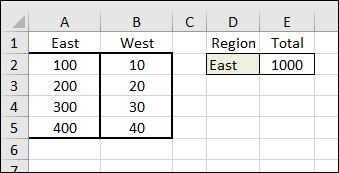 Change the cell address in cell A4, and the result in A6 will change. It includes =indirect.ext() that may help you. 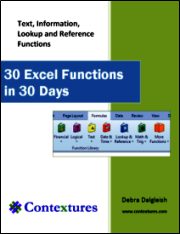 In addition to cell references, you can refer to named ranges in an INDIRECT formula. In this example, the INDIRECT function is used to sum the selected named range. In cells A1:B5, type headings and numbers, as shown at right. Press the Enter key, and the formula returns the sum of numbers in the East range. Change cell D2 to West, and the formula returns the sum of numbers in the West range. 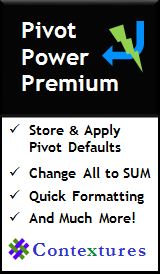 The INDIRECT function can be used with Data Validation, to create dependent drop down lists. For example, select the Fruit category in column A, and the data validation list in column B shows a list of Fruit options. There are instructions for this technique on the Data Validation - Dependent Lists page. Download the sample INDIRECT workbook The zipped file is in xlsx format, and does not contain any macros.